The purpose of this study was to investigate effect of gender and perceived professional development in ICT skills on science teachers’ use of traditional and alternative classroom practices. The data was obtained from the Teaching and Learning International Survey (TALIS) conducted by the Organisation for Economic Co-Operation and Development (OECD). Specifically, this research was focused on Turkish science teachers (n=308). The data was analyzed through Multivariate Analysis of Variance (MANOVA). The findings indicated that female teachers use traditional classroom practices significantly much more than male teachers. Moreover, science teachers who no need any professional development in ICT skills had significantly higher mean score on alternative classroom practices than science teachers who high need for professional development in ICT skills. The implications based on the findings were discussed. Amanatidis, N. (2014). An in service training course, (INSET) on ICT pedagogy in classroom instruction for the Greek primary school teachers. Education and Information Technologies, 19(2), 307-326. Chikasanda, V.K.M., Otrel-Cass, K., Williams, J., & Jones, A. (2012). Enhancing teachers’ technological pedagogical knowledge and practices: a professional development model for technology teachers in Malawi. International Journal of Technology and Design Education, 23(3), 597-622. Cohen, J., Cohen, P., West, S.G., & Aiken, L.S. (2003). Applied Multiple Regression /Correlation Analysis for the Behavioral Sciences. Third edition. New Jersey: Lawrence Erlbaum Associates, Inc., Publishers. Drudy, S. (2008). Gender balance/gender bias: the teaching profession and the impact of feminization. Gender and Education, 20(4), 309-323. George, D., & Mallery, P. (2003). SPSS for Windows Step by Step. Fourth edition. Boston: Allyn & Bacon. Green, S.B., Salkind, N.J., & Akey, T.M. (2000). Using SPSS for windows. Second edition. New Jersey: Prentice-Hall, Inc.
Grossman, H., & Grossman, S.H. (1994). Gender issues in education. Boston: Allyn&Bacon. Guskey, T.R. (1986). Staff development and the process of teacher change. Educational Researcher, 15(5), 5-12. Hennessy, S., Wishart, J., Whitelock, D., Deaney, R., Brawn, R., la Velle, L., McFarlane, A., Ruthven, K., Winterbottom, M. (2007). Pedagogical approaches for technology-integrated science teaching. Computers & Education, 48(1), 137-152. Kirkscey, R. (2012). Secondary school instructors’ perspectives on the integration of information and communication technologies (ICT) with course content. American Secondary Education, 40(3), 17-33. Kozma, R.B. (2003). Technology and classroom practices: An international study. Journal of Research on Technology in Education, 36(1), 1-14. Levin, T., & Wadmany, R. (2008). Teachers’ views on factors affecting effective integration of information technology in the classroom: Developmental scenery. Journal of Technology and Teacher Education, 16(2), 233-263. Norman, J., Stein, M., Moussiaux, S., & Clay-Chambers, J. (1998). The effect of the Detroit urban systemic initiative on perceived instructional practice and curriculum adequacy. Paper presented at the annual meeting of the national association for research in science teaching, San Diego, CA. Petegem, K.V., Creemers, B.P.M., Rossel, Y., & Aelterman, A. (2005). Relationships between teacher characteristics, interpersonal teacher behavior and teacher wellbeing. Journal of Classroom Interaction, 40(2), 34-43. Powell, J.C., & Anderson, R.D. (2002). Changing teachers’ practice: Curriculum materials and science education reform in the USA. Studies in Science Education, 37(1), 107-135. Ramey-Gassert, L., Shroyer, M.G., & Staver, J.R. (1996). A qualitative study of factors influencing science teaching self-efficacy of elementary level teachers. Science Education, 80(3), 283-315. Sang, G., Valcke, M., Braak, J., & Tondeur, J. (2010). Student teachers’ thinking processes and ICT integration: Predictors of prospective teaching behaviors with educational technology. Computers & Education, 54(1), 103–112. Sari, M. (2012). Exploring gender roles’ affects of Turkish woman teachers on their teaching practice. 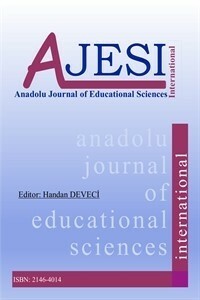 International Journal of Educational Development, 32(6), 814-825. Stevens, J. (2002). Applied Multivariate Statistics for the Social Sciences. Fourth edition. New Jersey: Lawrence Erlbaum Associates, Inc.
Supovitz, J.A., & Turner, H.M. (2000). The effects of professional development on science teaching practices and classroom culture. Journal of Research in Science Teaching, 37(9), 963-980. Sutherland, R., Armstrong, V., Barnes, S., Brawn, R., Breeze, N., Gall, M., Matthewman, S., Olivero, F., Taylor, A., Triggs, P., Wishart, J., John, P. (2004). Transformin teaching and learning: embedding ICT into everyday classroom practices. Journal of Computer Assisted Learning, 20(6), 413-425. Voogt, J. (2009). How different are ICT-supported pedagogical practices from extensive and non-extensive ICT-using science teachers? Education and Information Technologies, 14(4), 325-343. Wong, E. M. L., Li, S. S. C., Choi, T.-H., & Lee, T. N. (2008). Insights into Innovative Classroom Practices with ICT: Identifying the Impetus for Change. Educational Technology & Society, 11(1), 248-265.